Most probably, Relative Strength Index(RSI) is the first indicator that currency traders get introduced with. 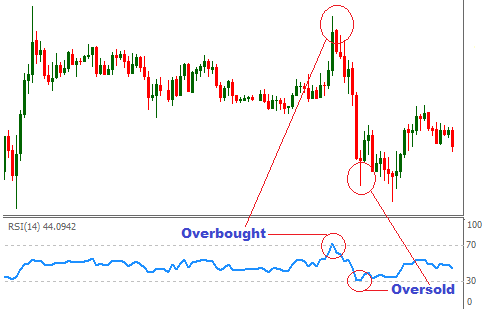 It is a very effective indicator to trade forex, that indicates the oversold and overbought conditions of the market. The indicator is developed by J. Welles Wilder and published in a 1978 book, "New Concepts in Technical Trading Systems", and in Commodities magazine in the June 1978 issue. 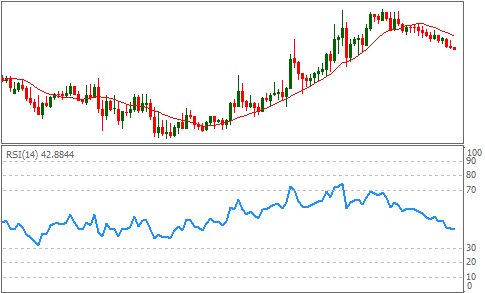 Before discussing the way to apply Relative Strength Index in trading, I am going to explain the installation process of RSI on metatrader4 trading platform. 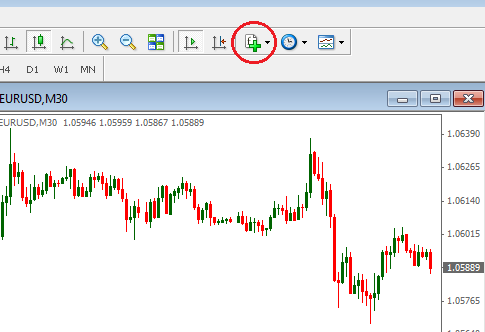 As other indicator, the first step to install RSI indicator on metatrader4 platform is clicking the f+ icon on the top of the platform. Look at the illustration below. When we click on the f+ icon, we see different groups of indicators. Click on the oscillators menu, and you will see a list of indicators, then select the Relative Strength Index(RSI). RSI indicator belongs to the group of oscillator s because it is a range bound indicator moves within a lower value and higher value. 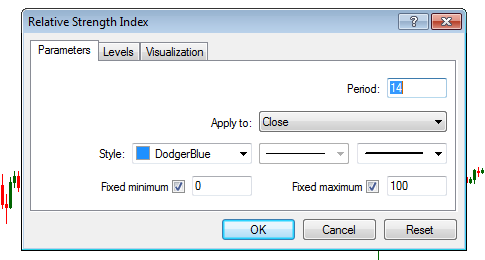 When you select Relative Strength Index from the list, you will see the window as the above image. From the window, firstly you should select the parameters menu which will enable you to select the period for the indicator, color, size, and design of the indicator. You can also chose the minimum and maximum value of the indicator, generally it is 0 and 100 respectively. The default period of the RSI indicator is 14, but a trader can choose other periods depending on the trading strategy. 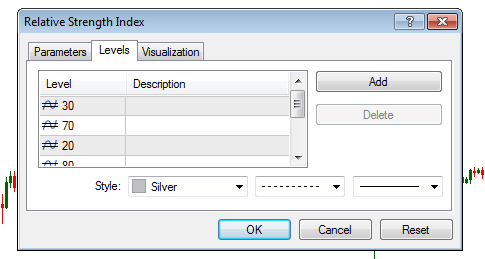 After that, traders can select the level menu to put different levels on indicator window. The default levels for the RSI indicator are 30 and 70. More than two levels can also be put. Have a look at the above image. A lower RSI values indicate over sold situations, and the higher RSI values indicate over bought situations. So the RSI value lower than 30 is a oversold situation that suggests a long entry, and the higher than 70 RSI value indicates a overbought situation that suggests a short entry. The RSI value lower then 10 indicates an extreme oversold situation, and a RSI value higher than 90 is an extreme over bought situation. If more than one levels are put on RSI window, it will look as the image below. In bottom line, we learned from the above explanation that a lower RSI values suggest long entry, and higher RSI values suggest short entry. More than one levels on RSI indicator can be helpful to understand the market situations more accurately. Traders should confirm their entries with other technical analysis tools to ensure the profitability of the orders.